Jennifer Lawrence, 21, will play tough-cookie Katniss Everdeen in the upcoming screen adaption of The Hunger Games, the first book in Suzanne Collins‘ fantastic trilogy for young adults. This isn’t a book blog, so I will refrain from ranting and raving about how this book is filled with too much amazing-ness . . . just know that everyone should give it a read, even if it is just a quick scan. And with an Oscar-nomination under her belt, chances are Lawrence possesses the ideal acting chops required to imbue Collins’s character with life. My hopes are high. “The Hunger Games” is slated to hit theaters this coming March and will begin filming in North Carolina in the coming weeks. Lawrence will act alongside some of Hollywood’s greats, including Stanley Tucci and Woody Harrelson, as well as some other recognizable faces, Liam Hemsworth, Elizabeth Banks, and Josh Hutcherson. 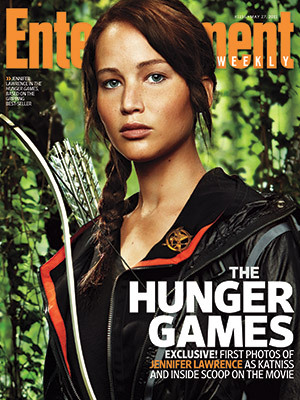 For an interview with Lawrence, and an awesome photo of her as Katniss, hop on over to Entertainment Weekly. ‘The Hunger Games’ Has Its Male Leads! Elizabeth Banks Confirms Role In Hungry Games!